Newtrend Bathrooms supply and install a wide range of disabled and easy access bathrooms, showers and wetrooms throughout Pelsall in a fantastic range of designs and styles. Newtrend Bathrooms supply and install a wide range of bathroom and shower designs throughout Pelsall in a fantastic range of designs and styles.With over 15 years experience in the bathroom industry we have noticed a significant increase in the popularity and availability of easy access bathing solutions. 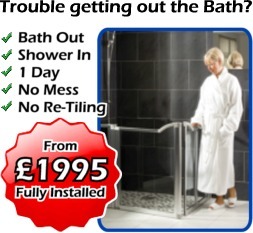 Everyone has their own bathing needs and we are able to advise and discuss all of your current or indeed future requirements as well as offering a free no obligation quotation should you require it. We carry out free home consultations to assess and discuss your specific requirements. Many people who use our less able products are registered disabled and therefore our products to these people are VAT exempt. A worry a lot of people seem to have is the look of the goods; they want to be able to wash and relax in safety and with the maximum comfort and ease but don’t want to sacrifice the look and style of their room. One thing we have learnt is that a lot has moved on in the last decade in terms of the technology behind the less abled bathing solutions and most are suitable for all ages and do not look out of place in any home. Whether it’s a conventional bath with an easy access door or a less abled walk in shower area; there are lots of different choices available to suit the individual needs of individual people. There is something for everyone in terms of comfort and style and a choice to suit all. Our less abled baths with electronic ultra-low glass doors are available in left or right hand and with five different panel colour options and easy to operate drainage system. These baths are also available with a power lift seat for easy lowering into the bath. Similarly our sit baths with built in moulded seat also come with dual wastes so that the water drains away faster and the bathing area is emptied quickly so that you are free to leave in a much shorter time. We also have on show our less abled showering options with full opening bi-folding doors and level access trays they are perfectly adapted for wheelchair access and their low sides makes assisted bathing simple and unproblematic. These showers are available in sizes to suit any bathroom and are suitable for people of all ages and ability. The doors on these shower enclosures have been subjected to extensive testing to meet the requirements of EU Construction Product Directive (89/106/EC) for durability, impact resistance and have anti-bacterial properties reducing the risk of harmful bacteria including MRSA. All are available in white or chrome finishes. Installation can be arranged if required with one of our teams of qualified installers, these people have many years of experience in the field and are approachable, friendly and happy to help.